Proper chuffed to see one whole minute of a static shot given to a snail going over a bench during BBC4's 'Dawn Chorus' production for the BBC4 Goes Slow season. Which way was the snail going to go? I thoroughly anticipated the snail to go over the front of the bench, but no, at the last moment, it turned along the bench. Why? Was there some juicy lettuce leaf put on the bench off camera? Welcome to drama on the Slow TV level. 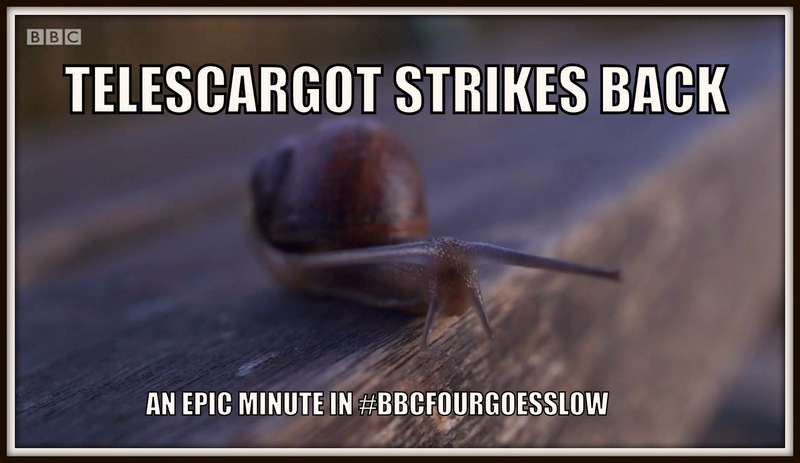 Telescargot: A contraction of the French words 'Tele' and 'escargot' - meaning TV and snail, respectively. Would translate as "Snail TV" - which works as a phrase to apply to Slow TV. First used in discussing the French TV production of Slow TV, "The Tokyo Reverse".